Pamela Froman Fine Jewelry: Pamela Froman is a Diva who gives back! Pamela Froman is a Diva who gives back! This year, The Women's Jewelry Association (WJA) partnered with the Diamond Empowerment Fund (D.E.F.) for their annual DIVA Design Competition, entitled "DIVA Gives Back!" There were 3 categories in the competition this year: "Canadian Diamond DIVA", "Red Carpet DIVA", and "DIVA Gives Back"... Pamela decided to submit renderings to the DIVA Gives Back category, which challenged designers to create "an inspiring design that can be mass marketed as an affordable jewel to support the Diamond Empowerment Fund. The current design is a unisex bracelet (the famous Green Bracelet designed by Russell Simmons) What would you create that everyone could wear to show their support for the children of Africa?" and one of her designs (shown above) was selected as the winner! Judges loved Pamela's unisex Dog Tag! 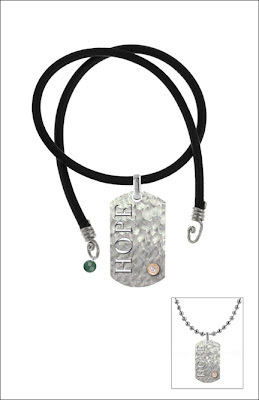 The word HOPE, the small diamond set in gold, and the green stone drop, all serve to remind us that proceeds from the sale of this piece will go to help the disadvantaged people in African nations where diamonds are a natural resource. Pamela also plans to create a "bling-y" version of this piece to be auctioned off at the star studded Dallas Rocks: The Diamond Dinner and After Party gala benefit and auction to benefit D.E.F. in November. Pamela Froman quoted in Vegas Magazine! Pamela Froman featured in the Jewelry Book!